Festive Fun With Our Furry Friends. I don’t know about you but I absolutely love Christmas! I just love everything about it, the Christmas trees, caroles, presents, family time and of course all of the food and drink! But do you ever have amazing ideas that don’t turn out the way you imagined? Here is my comical guide to Christmas with our furry friends. The Christmas ride. Now I attempted this once with my horse Stanley. I decorated his bridle & I had my Christmas jumper on. We went for a hack & I thought it would be all fun & festive. How wrong was I ?! Firstly Stanley found the tinsel so scary that he didn’t want to move when it was touching him. I did finally drag him out of his stable to go for a lovely ride but of course I was wrong again. Stanley was already very tense because of the scary tinsel but now everyone we passed in cars & on foot stopped to admire us & every time I waved or said something to anyone Stanley took as a que to try and run home. It was also very cold and my Xmas jumper was really itchy. One Christmas I lovingly prepared a stocking for my horse Cassie. I got my mum to drill through a swede so we could hang it in her stable so Cassie could spend hours playing with it. I bought Cassie a salt lick to put in her new stable too. Both of which she did not get at all. Like no clue. She sniffed them both then ignored them for the remaining weeks I left them in the stable for her. I bought her some treats as well but she only wanted the mint flavoured ones and wouldn’t eat her dinner if I put other flavours of treat in her bucket. Olympia. When I lived in the UK I loved going to Olympia before Christmas. It was lovely and festive. But my mum & I used to go and spend all of our Christmas money before we got it & then didn’t tell my dad how much we spent. Donating to a horse charity. Lots of people I know donate to charity during the festive period instead of sending Christmas cards. So why not donate to a horse charity? Well I have sponsored a horse before and was basically taken hostage by the horse I adopted. Because I am far too soft! I would get newsletters and photos of the horse and hear all about how badly he was treated before he was rescued. Then, every time I tried to stop donating as I needed money for my own food, I ended up renewing my adoption but paying more than I originally had done before. I think at one point I ended up sponsoring 2 ponies, bought dog toys for the local dogs home as well as giving £2 a month to cancer research and running a half marathon for water aid! But in all seriousness donating to charity is a good thing if you can afford to do so. Go to your local boxing day hunt meet. Its nice to see all the horses and riders dressed up ready for the hunt on boxing day. Its particularly nice to go watch them but then go back home and curl up in the warm when they head off! As when I went once it was basically a lot of very posh drunk people on horseback. I honestly don’t know how a lot of them managed to not die that day. Either by falling off their horses or drunkenly driving their lorries home! I’m really hoping that many of them had someone else driving them home. The Yard Christmas Party. A very important social event as it maybe the only time of year you see the other owners at your yard dressed like normal people. You might not recognise them without straw in their hair or when they are not wearing jodhpurs. Someone you least expect will probably get blind drunk and cause a scene. But at least you can spend one evening looking and smelling nice and have a few glasses of fizz together. Then the next day you resume to being covered in horse poo and ignoring each other whilst mucking out as you are terribly hung over. And finally going to the stables with your family, Christmas day is a weird day that everyone has more time (unless you are making christmas dinner for everyone) so I like to go to stables with someone that I don’t usually. So that basically meant that I’d go with my dad or my husband and freeze my socks off mucking out alone, while they sat in the warm car telling me to hurry up every time they saw me struggling to carry something heavy past their warm clean car. After mucking out as I was already dirty, I was always nominated to walk the dog too, and without a doubt he would either run off and be lost temporarily while I stood in the field alone in the rain or rolled in something that smells disgusting. It was never exactly what I had in mind! So there you have it. 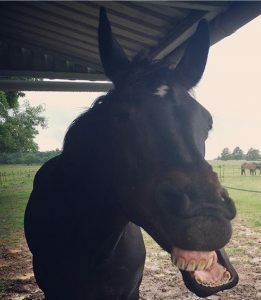 Do you have any funny festive stories about your horse? Any festive plans with your horse that were more successful than mine? Remember to join in our #induehorseparty and send me your Xmas pics to post on my Facebook & instagram story, so we can spread some festive spirit. Just tag me using @induehorse. Have a very merry Christmas everyone and I hope that your festive plans do go to plan with your horses! Next Post My Interview with The Sand Arena Ballerina.